WASHINGTON, D.C. - It was like watching the same movie all over again. 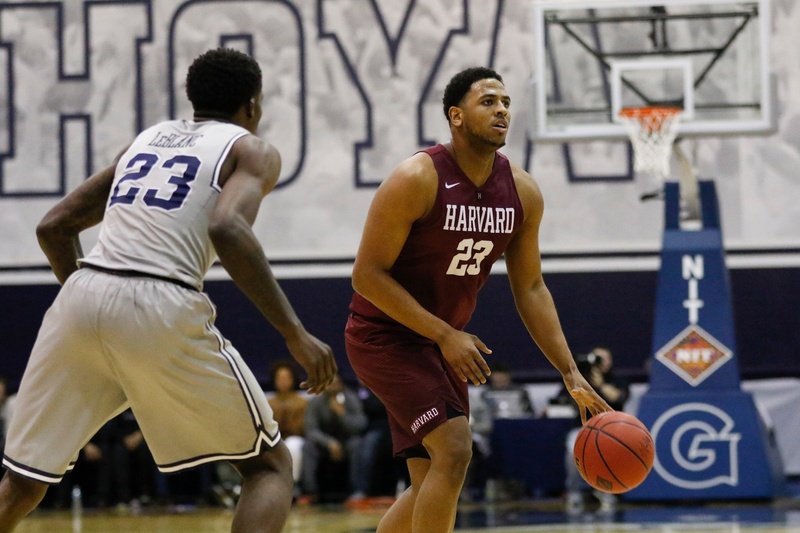 Four nights after giving up a seven point second half lead on the road in the Ivy League Championship, Harvard men’s basketball had a five point lead evaporate. 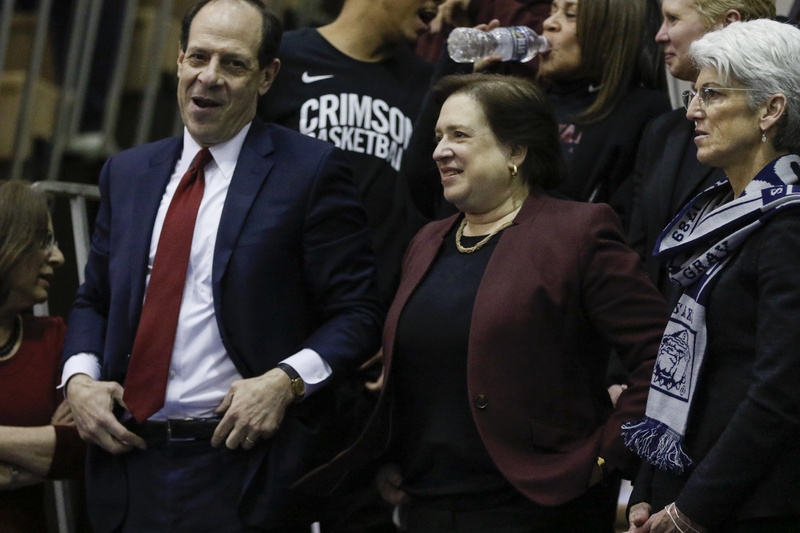 The Crimson allowed a 6-0 Georgetown run, as a raucous McDonough Arena crowd willed on the Hoyas in the first round of the NIT. The junior, who attempted an uncharacteristically low nine field goals, drew two critical fouls late in the game, and scored the final six points of the game for the visitors. The Randolph, N.J., native finished with a team-high 18 points, but his savvy veteran presence in the dying moments of the game were amongst the biggest highlights of Wednesday night’s victory. Amaker opted for an unconventional lineup, with junior guard Christian Juzang missing due to illness. Senior captain Weisner Perez was inserted into the starting five, and the Berwyn, Ill., native provided energy and effort from the get-go. In the opening minutes, Perez converted a layup and and-one, registering four rebounds and five points by the first TV timeout, propelling the team to a 13-6 lead. Those five points were more than he had scored all season, and Perez’s energy on the offensive glass set the tone on a night when the Crimson would out-rebound a physically gifted Hoyas’ team by a 39-30 margin. Georgetown freshman Mac McClung provided an early lift for the Hoyas, with six quick points as the hosts brought the score back to even by the second media timeout. 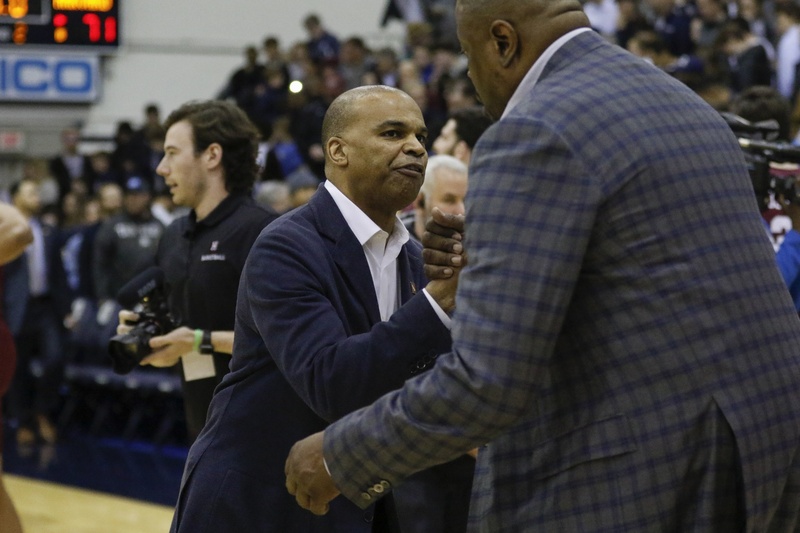 Georgetown’s size provided immediate issues on the inside, with Ewing’s side taking advantage of the Crimson’s smaller lineups offensively, and igniting a capacity crowd. With the Hoyas playing most of their games at the Capital One Arena in downtown Washington, the unorthodox on-campus game, due to a Capitals game previously scheduled, allowed for a loud, energized environment. Despite its limited size, Harvard earned a plethora of offensive rebounds in the opening portion of the contest. The visitors out-rebounded the Hoyas 14-9 at the nine-minute mark, including six on the offensive end. The Crimson, however, got itself into a scoring slump but held ground on the opposite end, with the Georgetown lead at just two heading into the final eight minutes of the half. Aiken finally broke that drought with a three to put Harvard back in front 19-18, as Perez returned to the court after early success in the game. Junior Robert Baker, who also had seen multiple DNPs to finish the season, checked in to the contest at the 5:32 mark as Govan’s size equated to fouls for Chris Lewis. Henry Welsh quickly followed suit. The junior tallied an immediate lay-up in front of his brother Thomas Welsh, a two-way player with the Denver Nuggets, who was in town to play the Wizards tomorrow night. The Hoyas pushed to its own small run to energize the strong student contingency, but the Crimson answered back to even things back at 30 as Welsh drove in uncontested for his second layup. Both teams struggled from beyond the arc with the extended three-point line, as Harvard shot 1-of-10 compared to 1-of-8 from the Hoyas in the first half. After going for a career-high 38 points against Yale, Aiken returned back to the locker room still looking to rediscover his groove. But a mark of five consecutive field goals from the rest of Aiken’s team stood up to a late spurt by Georgetown freshman James Akinjo, and the Crimson trailed by just a one-point margin heading into the half. Bassey kicked off the second half with a triple and Lewis finished a righty hook to put the Crimson back on top 40-36. But Jessie Govan caught on fire from deep, draining two threes to even the score back at 42-42. Aiken returned the favor with a three of his own, but not before Govan drained another triple. The Georgetown senior big finally missed on his fourth “heat check” attempt, but the Hoyas had all of the positive energy it needed and began to widen the margin heading into the the second media timeout. As the second half ticked on, Aiken re-entered and began to assert his will. But the late 6-0 run from the hosts threatened to end the Crimson’s season. But when Amaker called a timeout with 3:36 and Harvard trailing, the visitors had a moment to catch their breaths. With the game slipping out of reach, mentally weaker teams might have given in. But with its backs against the wall, playing for the careers of seniors like Perez, the Crimson refused to go quietly into the night. Cutting down on turnovers and out-scoring the Hoyas 10-2 in second half bench points, Harvard were able to put the finishing touches on its most impressive victory of the season. It would have been understandable for the Crimson to fold. As the crowd got louder, and the Hoyas’ run extended, giving the hosts the lead, the odds seemed stacked against Harvard. 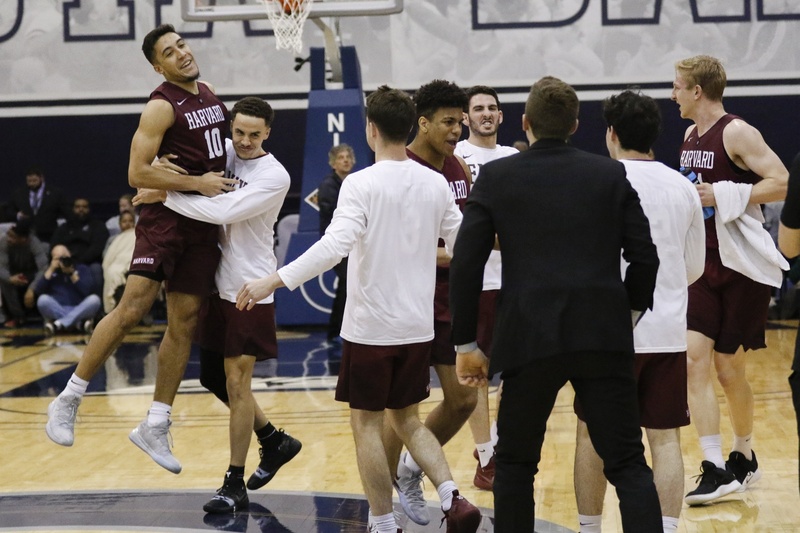 After all, just four nights earlier, the Crimson had suffered a heart-wrenching loss to the hands of rival Yale, and found itself going up against the momentum of the crowd, and Govan and the rest of Coach Patrick Ewing's team. But with the season at its most precipitous point, Amaker’s team found a way to fight back. Five players finished with nine points or more, a testament to the balance of the team. Harvard will travel to play N.C. State in Raleigh on Sunday, facing yet another do-or-die game. But with the Crimson two wins from Madison Square Garden, it seems appropriate to appreciate the significance of going on the road, and knocking off Georgetown, one of college basketball’s greatest blue bloods.